I hope you all had a wonderful Thanksgiving! I know we did. My contribution to the table this year was some fresh bread. 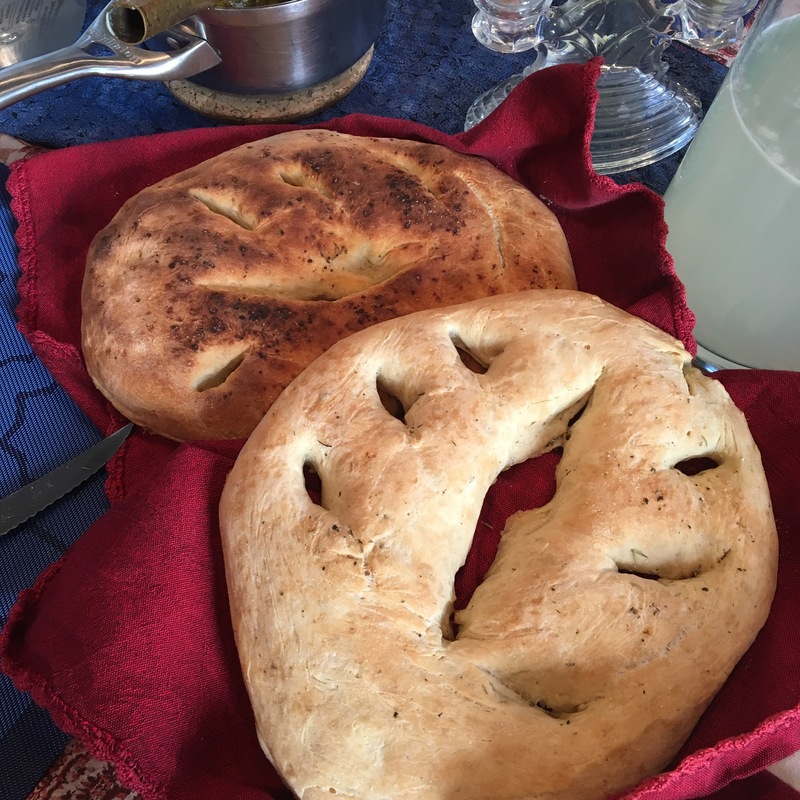 Fougasse is a French-originated bread shaped to resemble a leaf and flavored with herbs de provence. Yum! Start by combining the yeast and warm water. Let stand for ten minutes. Then, stir in a cup of the flour along with 2 of the teaspoons of herbed salt and half of the rosemary, along with 3 tablespoons of olive oil. Slowly add the rest of the flour until the dough is smooth and thick. Knead the dough until elastic- about 10 minutes- on a floured surface. Roll the dough into a bowl and place in an oiled bowl, turning to coat. Cover with plastic wrap and a towel and let rise for about an hour and a half. Then, punch down the dough and divide in two. Shape each into ovals about 12 inches in length and 8 inches in width. Transfer to oiled baking sheets. Using a sharp knife, make cuts in each loaf, a long vertical line down the center and smaller diagonal cuts to represent the veins of the leaf. Brush on the remaining olive oil and sprinkle with the remaining salt and rosemary. Then, pull apart the cuts very gently. Cover loosely with a tea towel for 20 minutes. One at a time, bake the loaves on the bottom rack of a 425 degree oven for about 20 minutes, rotating the pan halfway through. Take out when the loaf is golden and sounds hollow. Let cool briefly and then serve!